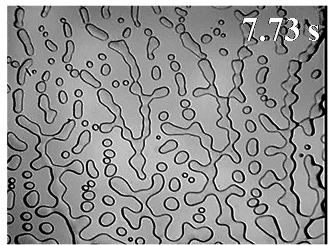 Formation of an interfacial pattern between a thin film of soft gel and a rigid glass plate that also shows the motion of bubbles. A hydrostatically-stressed soft elastic film responds by developing a morphological instability, the wavelength of which is dictated by minimisation of the surface and elastic strain energies of the film. For a single film, the wavelength of this transition is entirely dependent on the film's thickness, however in the case of two contacting films a co-operative energy minimisation dictates that the wavelength depends on both the elastic moduli and the thicknesses of the two films. Sandcastles are a prime example of how adding a small amount of liquid to a granular material changes its characteristics. But understanding the effect of a liquid wetting randomly oriented fibres in a fibrous medium remains a mystery. Relevant to the building industry, which uses glass wool, for instance, this phenomenon can be better understood by studying the behaviour of a liquid trapped between two parallel fibres. It can either remain in the shape of a drop or spread between the fibres into a long and thin column of liquid. Now, scientists have demonstrated that the spreading of the liquid is controlled by three key parameters: the amount of liquid on the fibres, the fibres’ orientation and the minimum distance between them. These findings, based on experimental and modelling work, were recently published in EPJ E. The authors are Alban Sauret, a scientist working at a laboratory jointly operated by the CNRS and Saint-Gobain, a building materials manufacturer in France, and international colleagues based at Princeton University and the NYU School of Engineering, USA. A recent EPJ E Colloquium by Jose Manuel Valverde looks at the fundamental physics that causes convection and fluidization in vibrated beds of particles with large inertia. The author examines the question of whether acoustic streaming arising from oscillatory viscous flows might play a role on the onset of convection and fluidization in vertically vibrated granular beds. Acoustic streaming, first observed by Faraday in 1831, is an enigmatic phenomenon that has puzzled physicists for a long time. It occurs when a viscous fluid oscillates in the presence of a solid boundary. The dissipation of energy by viscous friction leads to a secondary steady circulation of fluid in a boundary layer near the surface of the solid, which enhances the gas-solid viscous interaction. Granular beds display, at sufficiently high vibrational intensities, surface patterns that bear a stunning resemblance to the surface ripples (Faraday waves) observed for low viscosity liquids. This suggests that the granular bed transits to a liquid-like regime, despite the large inertia of the particles. Water behaves in mysterious ways. Especially below zero, where it is dubbed supercooled water, before it turns into ice. Physicists have recently observed the spontaneous first steps of the ice formation process, as tiny crystal clusters as small as 15 molecules start to exhibit the recognisable structural pattern of crystalline ice. This is part of a new study, which shows that liquid water does not become completely unstable as it becomes supercooled, prior to turning into ice crystals. The team reached this conclusion by proving that an energy barrier for crystal formation exists throughout the region in which supercooled water’s compressibility continues to rise. Previous work argued that this barrier vanished as the liquid gets colder. These findings have been published in EPJ E by Connor Buhariwalla from St. Francis Xavier University in Antigonish, Canada and colleagues. Our understanding of biomechanics increasingly improves through the use of physics models. 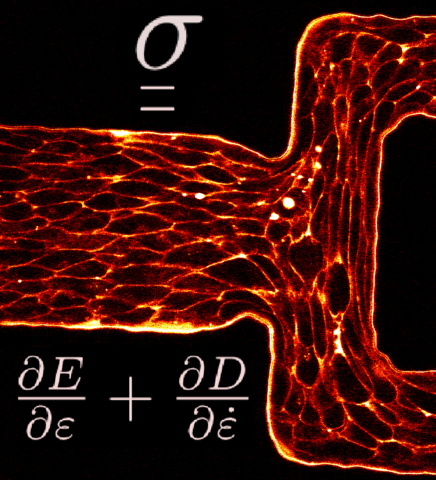 There are some intriguing biological questions regarding the interplay between the behaviour of cells and the mechanics at the level of tissues. For example, how does a collective behavior, not apparent at the cell scale, emerge at the tissue level? Or how can the mechanical state of a tissue affect the cell division rate or the orientation of cells undergoing division? The authors of this new EPJ E Colloquium entitled “Mechanical Formalism for Tissue Dynamics” think that the interplay between genes and mechanics is key to understanding how the adult shape emerges from a developing tissue. What does space experimentation have in common with liquid cocktails? Both help in understanding what happens when multiple fluids are mixed together and subjected to temperature change - a phenomenon ubiquitous in nature and industrial applications such as oil fluids contained in natural reservoirs. The latest experimental data performed in zero gravity on the International Space Station is now available in the newly published Topical Issue of EPJ E. The results constitute the first set of highly accurate and broadly validated data on the thermodiffusion effects that occur when three different liquids are mixed. Such experiments were made possible by a collaboration of space agencies including the ESA, NASA, CSA and ROSCOSMOS. Binding of a dipolar microsphere with a point monopole on a fiber. Sitting with a joystick in the comfort of their chairs, scientists can play “rodeo” on a screen magnifying what is happening under their microscope. They rely on optical tweezers to manipulate an intangible ring created out of liquid crystal defects capable of attaching a microsphere to a long thin fibre. Maryam Nikkhou and colleagues from the Jožef Stefan Institute, in Ljubljana, Slovenia, recently published in EPJ E the results of work performed under the supervision of Igor Muševič. They believe that their findings could ultimately open the door to controlling the flow of light using light of a specific frequency in the Gigahertz range in liquid crystal photonic microdevices. Sand, rocks, grains, salt or sugar are what physicists call granular media. A better understanding of granular media is important - particularly when mixed with water and air, as it forms the foundations of houses and off-shore windmills. Until recently, there was no single theory that could account for granular media’s flows at different speeds. Now, a new theory dubbed GSH, which stands for granular solid hydrodynamics, is supplementing previous models of granular material that work only for narrow speed ranges. And Yimin Jiang from Central South University, Changsha, China and Mario Liu from the University of Tübingen, Germany have now applied GSH to different experimental circumstances, for a wide range of flow speeds, in a study published in EPJ E.
EPJE Associate Editors Kari Dalnoki-Veress and James A. Forrest open the journal for submissions of a new type of paper: Tips and Tricks. Underpinning the scientific enterprise there is often some crucial numerical recipe, a sample cell configuration, a sample preparation method, or experimental design. In some cases more emails were shared describing a trick than citations gathered by the paper where a brief description was provided. Typically such details are only briefly described in the journal literature, passed only from student to student, or simply shared as a ‘personal communication’. Sometimes such enabling techniques are not passed on at all. In all such cases, the scientific community as a whole is missing out, lacking a way to document this knowledge and to build on it. Moreover, while the specific research of some team may not be directly relevant to another, a transformative computational or experimental methodology can form the commonality between researchers working in different fields. 2015 will see the launch of a new section of EPJ E: Tips and Tricks. EPJ E Highlight - How do vertebrates take on their form? A simple physical mechanism that can be assimilated to folding, or buckling, means that an unformed mass of cells can change in a single step into an embryo organized as a typical vertebrate. This is the main conclusion of work by a team involving physicists from the Laboratoire Matière et Systèmes Complexes (CNRS/Université Paris Diderot) and a biologist from the Laboratoire de Biologie du Développement (CNRS/UPMC). Thanks to microscopic observations and micromechanical experiments, the scientists have discovered that the pattern that guides this folding is present from the early stages of development. The folds that will give a final shape to the animal form along the boundaries between cell territories with different properties. This work has shed light on the mechanism for the formation of vertebrates and thus how they appeared during evolution. These findings have just been published in EPJ E.